Samyang has recalled two Premium XP lenses in Europe due to a design infringement dispute with German optics manufacturer, Carl Zeiss. The Batis and Samyang. Sorta similar, eh? Apparently there’s enough in it for an entire European recall! The lenses are the Samyang Premium XP 50mm f1.2 and 85mm f1.2 for Canon EF mount, which supposedly rip off the Zeiss Batis 50mm f1.2 and 135mm f2.8. However, Australian Samyang distributor, Maxxum, informed ProCounter the recall is exclusive to Europe and the lenses will continue to be sold locally. 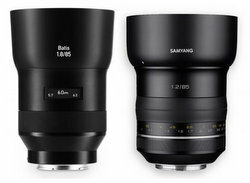 Samyang’s Swedish distributor, Focus Nordic, reported in late May the Premium XP lenses are currently being removed from all shop shelves and returned to the distributor. While details of Zeiss’ claim haven’t been revealed, Focus Nordic points out the optical design is different while the exterior body shape is similar. Photo news aggregate blog, Petapixel, also compared the optical and exterior design to find only the exterior similar. Focus Nordic marketing manager, Per Skog, explained to Swedish tech industry magazine, Monitor, that retailers all over the world will recall the lens. But Maxxum was told by Samyang the issue is exclusive to Europe. ‘We have been informed from Korea that the issue is related to Europe only and we can continue to sell Samyang XP lenses in Australia,’ Maxxum sales director, Glenn Ward, told ProCounter. Perhaps Google Translating the article from Swedish to English muddled the information, or Focus Nordic was misinformed regarding the reach of Zeiss’ design infringement claim. Europe intellectual property law is stricter than other parts of the world, and it may be that the South Korean manufacturer is only accountable in the EU. So it appears Australian (and other non-European) retailers and customers, including in the USA, don’t need to worry.